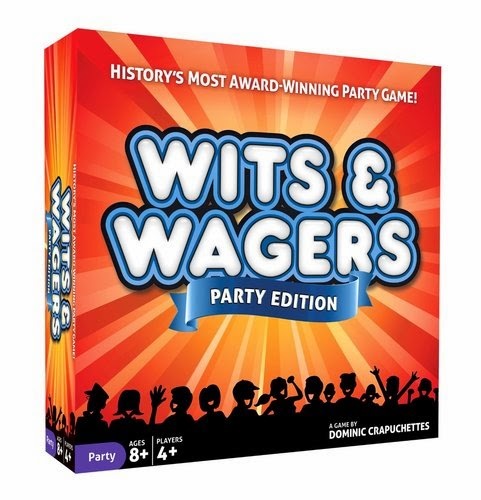 From the creators of Say Anything, here's another famous party game hit for your table. "Not a trivia buff? It doesn't matter" say the game designers themselves...because players can bet on other people's answers. As the game's box endeavours to inform us, it is the "most award winning party game in history". This may be true but that doesn't mean it is the best game in history; although I really like this game I do think it is slightly overrated. Versions: I am reviewing the standard or normal edition that comes with the yellow box. It has 7 mini whiteboards (ie. dryboards) and whiteboard markers. The Family Edition (which comes in a blue box) only has 5 mini whiteboards and markers. The Party Edition (red box) comes with 6 mini whiteboards and markers. There is also a Deluxe Family Edition which comes with an extra player whiteboard and marker (as compared to the 'normal' Family Edition) and meeple stickers, but is otherwise exactly like the Family Edition. Also, the normal edition I am reviewing only has 100 question cards in contrast to the other two versions which have 125 cards. Both the Family and Party editions allege that they are different to the normal version in terms of their rules, questions and gameplay. For example, according to Dominic Crapuchettes on BoardGameGeek the Party edition has questions that are lighter and "more fun" (ie. questions that are less academic or serious) whilst its gameplay involves less "accounting" in the sense that scoring is simplified (which I think obviates the need for bets to be paid out) . Therefore the Party edition is supposedly targeted at non-gamers (such as relatives or family) and removes the casino feel of the game. Whether this is so is highly questionable: plenty of "non-gamer" friends, relatives or family, including those who are academics, would enjoy that kind of environment and feel to a game. Of course, only you would know your friends and relatives the best. Also, we are told that apparently the Family edition is better for kids. Whether any of this is true I don't know for sure but please do be wary of the different versions out there. You are of course free to make your own rule modifications (and indeed, questions) in any event to suit. 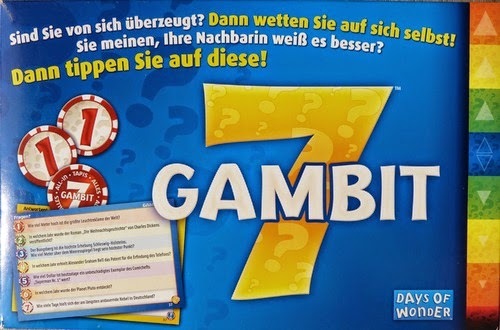 There is also even a game called "Gambit 7" (also designed by Mr. Crapuchettes) which prima facie looks extremely similar to Wits and Wagers albeit with different (and a wider variety of?) categories of questions that are apparently not focused on the United States (although I wouldn't know for sure as I've never played it). 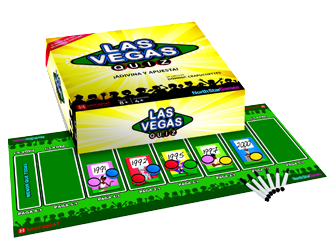 This game also has a Spanish Edition called "Las Vegas Quiz" published by Morapiaf, which presumably (the marketing team thinks) is a more enticing title to that populace. Time to play: 25 mins apparently. As long or as short as you like. Price Range (AUD): $40 to $53++ (I have even seen a copy selling for $103). I got mine for about $36. That range is quite expensive to be honest. Availability: Widely available online and in hobby game stores. Although I'm not sure it is popular enough to make its way into mainstream department stores here in Australia (the last time I checked anyway). This is a pretty good party/trivia game that incorporates the classic and ever popular theme of wagering. One key aspect of this game that gives it its kick is that you or your team mates do not need to come up with a good, or even remotely close answer to the real answer; all that really needs to happen is that your team must choose from (or bet on) one of the different answers that every team has provided. The correct answer is the closest answer without going over. Therefore if the real answer is 20, 19 (if the closest) is a winning answer, but not 20.5 or 22. This feature of betting on answers, especially to questions that are usually interesting and diverse, is quite fun and is the main gimmick that keeps people going, especially in a party environment. My main criticisms of the game are that the questions are not only outdated (by, sometimes, more than 5 years) but they are also too focussed on the USA; however, of course, this latter issue isn't really a problem because most people think highly of the United States (whether they ought to is a completely different issue that I won't debate here =P) and therefore trivia relating to it is generally still well-received or at the very least, quietly accepted. The former issue can be resolved by just telling everyone what year they should have in mind when considering the question. There is also the issue of paying out bets based on the odds provided (which vary depending on the answer selected - please see below Rules for a better idea); not everyone will be familiar with or comfortable with a game that uses a payout mechanism to decide points - you might think that such a system should be intuitive to most people but one shouldn't necessarily assume that. I can also imagine that some conservative families who play this game might object to the game on the grounds that it is a form of gambling, even if it is only a mild one at that. However let me not be too harsh on this game. It is a very good one, and is one of those games that can play an unlimited number of people (in the sense of "how many people can I comfortably fit into my room?"). However, in my view, I do prefer other games that have a bit more strategy involved and thus I can't score this too highly. That being said, in the party genre of games, this is definitely up there on my list. I will note here though that I much prefer Say Anything because I find that the variety of answers to choose from in that game is generally more creative and interesting (contrast this to Wits and Wagers where all answers are numerical); further I like Say Anything because it's a game that works quite well with your friends or if you'd like to know people better. Both are similar in nature as they involve wagering on answers. Even in current editions of the game, and although every year questions are updated to reflect current general knowledge, many of the questions and answers are limited to dates that are quite some time ago (eg. There's a question on the population of Wyoming based on the 2006 US Census Bureau) - it is therefore important the group understands that the answer provided is outdated and limited to a particular point in time. 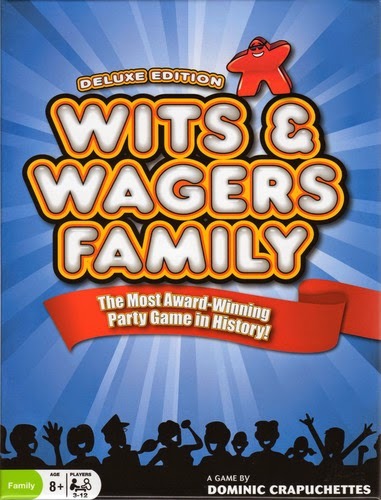 Although it has good replayability and there is a wide variety of questions, if you play it too much you may need to buy new questions (Wits and Wagers Expansion Pack 1) - a deeper problem is that this game relies on fresh trivia to make it interesting (contrast this to Say Anything where that is an irrelevant consideration). Gambling themes - would only bother the sensitive. I only add this for completeness. If you enjoy a massive party game that involves placing bets on answers to interesting trivia questions, give this a go. You'll see some plastic and cardboard betting chips; 7 whiteboard ("dryboard") markers and mini-whiteboards, just like in Say Anything; a timer and question + answer cards. What happens is everyone will be divided into teams - it is up to you how many groups there will be and how many people should be in each group. However anywhere from 4 to 7 groups is a good number depending on the number of people involved. Give each group a whiteboard marker, a whiteboard and 2 cardboard chips. No one starts off with plastic chips - these are earnt during the course of the game. A randomly selected individual draws a card (yellow side up), careful not to expose the blue answer side to anyone, including themselves. Everyone then writes down an answer and the answers are arranged on the betting mat in ascending order, with the lowest answer placed closest to the left part of the mat that says "Smaller than the smallest guess". And then everyone bets on an answer with their 2 cardboard chips (which will never be lost) and plastic chips (which can be lost). The "correct" answer for betting purposes is the one that is CLOSEST to the real answer WITHOUT going over. Bets are paid out according to the odds given. Answers are rubbed off and a new question is asked, with the above process repeated. Suppose the question is "As at early 2007, what percentage of the world's population lives in Asia?" As you can see, the lowest answer (30%) is sitting on the 5:1 payslot on the left. The middle slot (2:1) is left empty because there are two tied answers (70%) on the far right (also sitting on a 5:1 payslot). Purple has wagered both cardboard tokens on the 6:1 pay slot, meaning that if the answer is 29.999% or less, the Purple Team will get 12 coins. Therefore those who bet on the 60% answer are correct because 60% is closest to 60.6% without going over. 61% has gone over the actual answer and is therefore wrong. Everyone gets their wagering tokens back, but Grey gets a payout of 6 red chips (or 1 blue and 1 red) whilst Yellow gets a payout of 3 red plastic chips. No one else wins anything. Red is worth $1; Blue is $5; Green is $25 (these values can be changed). From now on, if the Yellow or Grey team bets with these plastic chips, and they guess incorrectly, they will lose the plastic chips permanently. However, of course, there is a chance to earn a bigger payout if one bets using the plastic chips. Whoever has the most chips/money by the end of the game wins.